SPRING IS HERE!!! And...Confession time: I would totally pay someone to do our laundry all the time if I could! I don't mind washing it but the folding and putting away take ages at our house. I end up rewashing the wrinkled things all over again because they've had so many more clean loads piled on top. I guess no one is perfect though, right? ;-) I thought it would be fun to add a little pizazz to my laundry routine since I don't see a laundry fairy coming by anytime soon! If you have to do laundry, why not make it at least fun?! Right?! ;) This laundry recipe is perfect for a pick-me-up scent and great cleaning boost, plus it's cheap! (win, win, right?!) PLUS it's HE washer friendly! Score!! Mix everything in a bowl. Add to a blender and blend until it reaches a whipped consistency (about a minute). I used a mini blender and added a few extra lavender drops with each batch, just because I love lavender that much. You could easily sub lemon, orange, or grapefruit if you like citrus instead! Add it to a mason quart jar, add a ribbon for a little pizazz, and voila! You're done! Add 1 tablespoon to load (or two for extra cleaning strength). 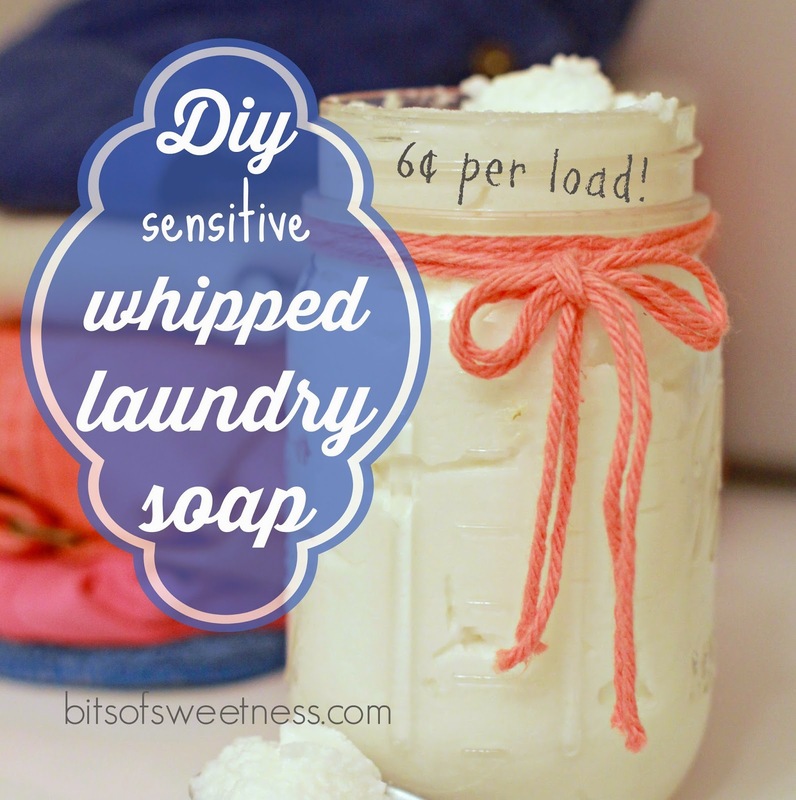 This recipe really makes your laundry soap last! One cup turns into four cups and you only need 1 tablespoon per load! It quadruples the original amount and because it has washing soda added, you're not losing cleaning power! 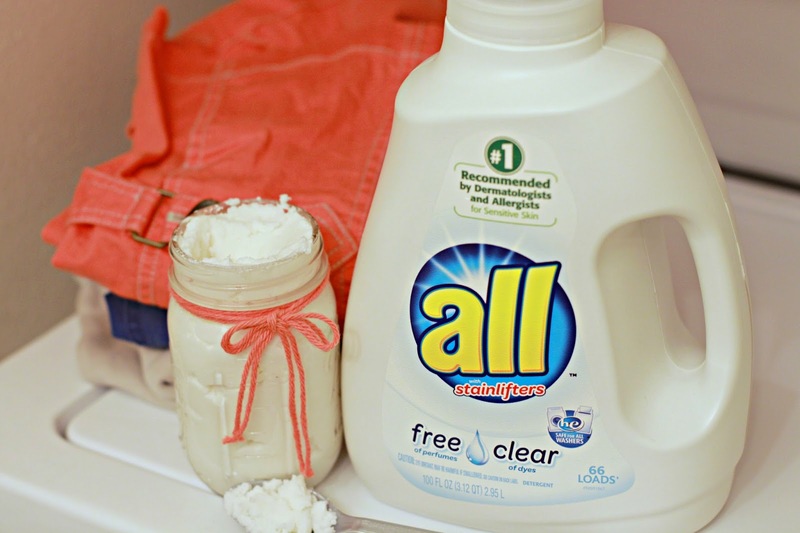 I love all clear free detergent for a few reasons! The price, the cleaning power, and the fact that it frees me up to do other things besides get stains out of our clothes! Sometimes inexpensive brands can leave stains (or not get them out). What is your favorite laundry trick? I will take all I can get with 2 busy messy boys!! Check out all's Facebook page here and see some great helpful tips to make your laundry life a little easiser! If you head here, all would love to hear from you! What do you love about the brand? Just a sidenote: If your kids suffer from eczema or tend to breakout from strong things, you may want to sub a different laundry detergent, just to be safe! The stain lifters in all's clear free detergent are awesome, but can cause a reaction for those with super sensitive skin. What a neat idea Laura!